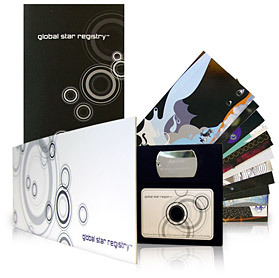 If you’re looking for the ultimate corporate gift for Christmas or other occasions, Global Star Registry offers customizable gifts that are ideal for colleagues, clients, and friends. Naming a star in Global Star Registry is a gift that will have the office talking for months after the party. We give you a unique opportunity to name multiple stars as corporate gifts. Few things will make a person feel the holiday spirit as this one-of-a-kind gift! If you still haven’t settled on a gift, personalizing a star in the night sky in Global Star Registry is a suitable alternative for this holiday season! GlobalStarRegistry.com gives you multiple gift options that are perfect for friends and family, but they also make corporate gift-giving easy as 1-2-3. You don’t need to run through stores, choose individual gifts for your colleagues or clients while struggling with the load. Just drop as a line below and you can order our traditional Star Gift Packages in bulk. To guarantee fast shipping, each corporate gift order is shipped via UPS. Who are these corporate gifts suited for? There isn’t a person in the office, who wouldn’t appreciate such a meaningful and personalized gift! Go the extra mile (to the Moon and back actually) when it comes to giving a named star as a gift. Contact us to learn more about our Corporate Gift Star Package. Simply fill out the contact form below and we’ll get back to you as soon as we can. We’ll make sure your next corporate celebration is memorable!